If you are a solar eclipse enthusiast, you may know my software SET'n'C, which is available for free from this web site (SET'n'C). 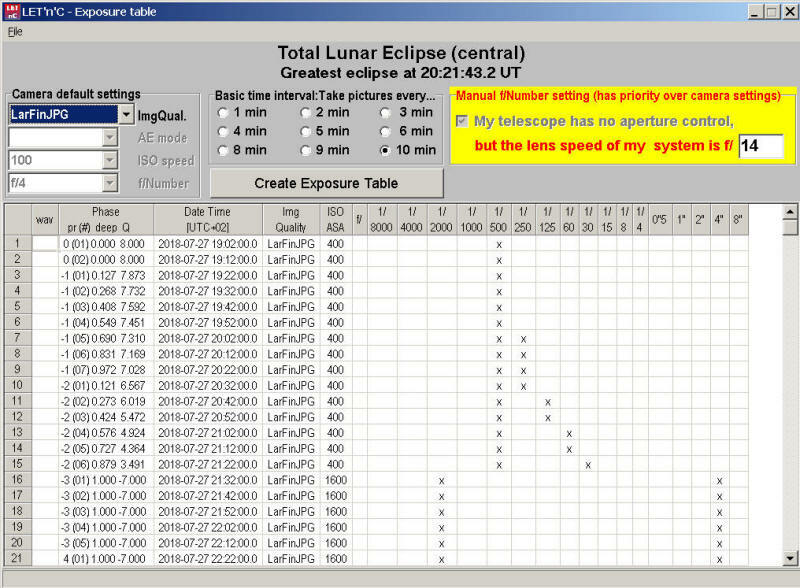 With this software (running on Microsoft Windows systems), exposure tables for the automated solar eclipse photography using Canon EOS digital cameras can be created with a few mouse clicks. I have now written a similar program for lunar eclipses: LET'n'C (Lunar Eclipse Timer and Camera Controller). It is possible, that LET'n'C unintentional brings your camera in a severe status (Error 70). This issue occurred in older versions of SET'n'C, but it is corrected in the mean time. Normal camera operation can then be achieved running Canon's EOS Utility. Before downloading LET'n'C, you should therefore download and install Canon's EOS Utility. Read the contents of this page before you run the program. During the progress of a lunar eclipse the surface brightness of the Moon varies (much more than you would expect). Therefore exposure times (and other settings) have to be adjusted over a wide range during the course of the eclipse. 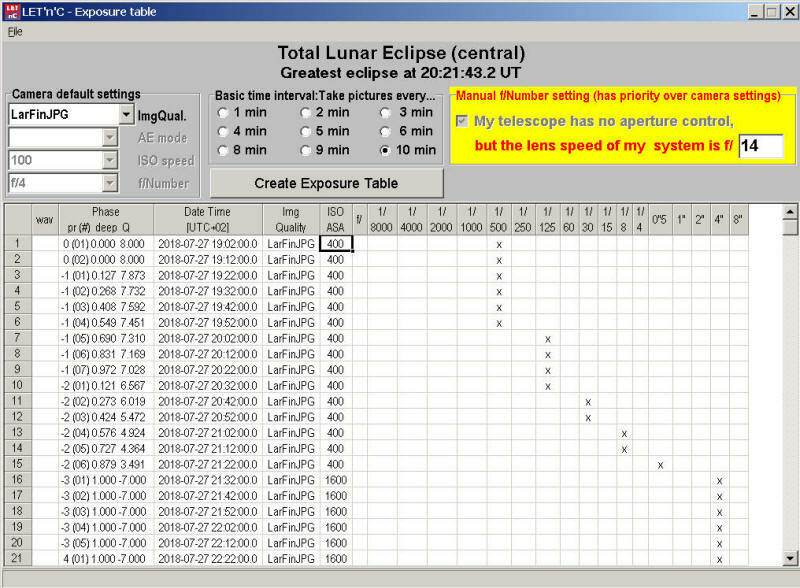 In 2008, Fred Espenak published the table Lunar Eclipse Exposure Guide. Using the formula t = f2 / (I x 2Q) , the shutter speed (exposure time) t in seconds is computed. The formula for Q and an the table layout are used with friendly permission from Fred Espenak. 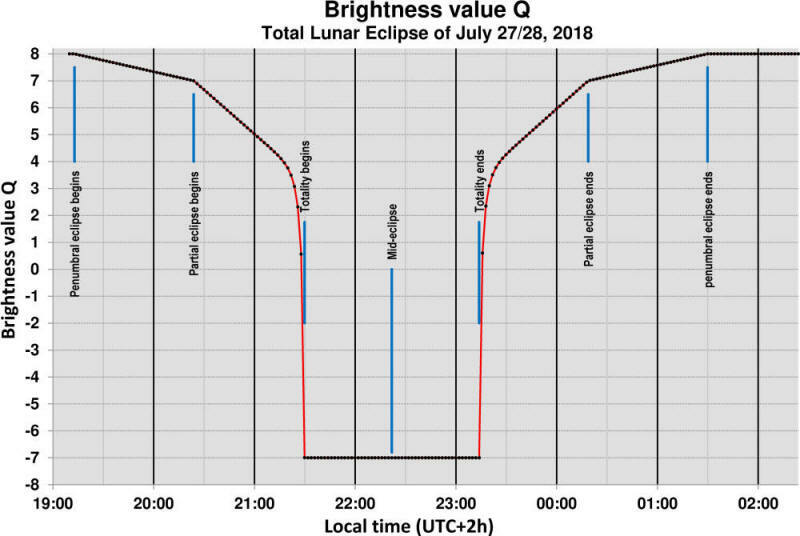 For Full Moon, brightness value Q is 8. Setting ISO to 200 and aperture to f/11, exposure time 1/500 is proposed. Then, the Moon enters the Earth's penumbral shadow and reaches the umbral shadow. At this moment partial eclipse magnitude is 0.00, but brightness value Q has lowered to 7. Proposed exposure time is 1/250. As the partial eclipse magnitude increases, the brightness value Q decreases. Once totality is reached, brightness value Q is set (assumed) to -7, and an exposure time of 8" has to be set. During the very early and late (penumbral) phases, brightness value Q is interpolated linearly between Q=8 and Q=7. During the partial eclipse phases, brightness value Q is computed using the formula shown in the blue region of the above image, yielding the red curve. Just for fun, or for control purposes, the key characteristics of all lunar eclipses between the years -4999 to +7000 can be checked using my free software LInspektor, which is available from my web site. 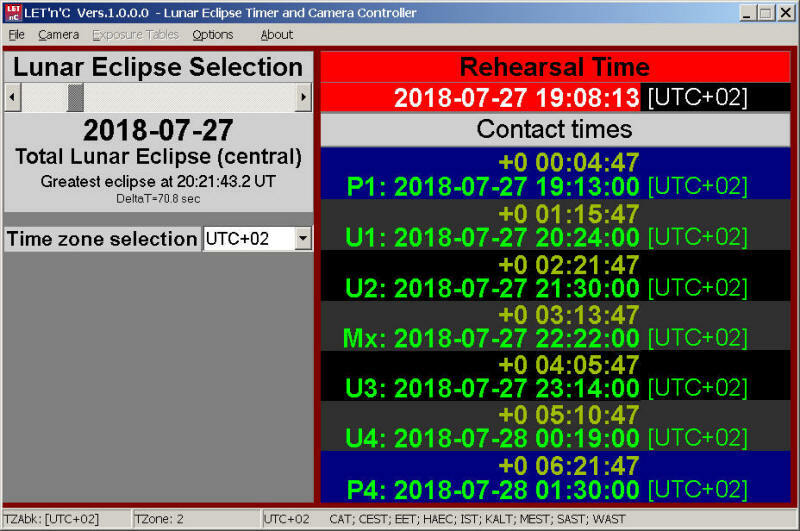 LInspektor Screen dump for the total lunar eclipse of July 27/28, 2018. The map in the lower right corner shows the zones of visibility. The green dot indicates the geographical location of Hurghada/ Egypt. This will be my observing site for the eclipse. LET'n'C: What equipment is needed (or suggested)? A tripod for the camera/optics; preferably a parallactic mount. A motorized guiding system to keep the Moon in the field of view during the eclipse. A computer running Microsoft Windows (XP / 7 / 8 / 10). A Canon EOS Digital camera equipped with a photographic (Tele) lens or a telescope. A right-angle viewfinder for comfortable viewing (for example Canon Angle Finder C + Adapter) (suggested). A USB cable for the connection between the camera and the computer. Eclipse enthusiasts love eclipses, not learning scripting languages. Therefore, the main goal of the program design of LET'n'C is user-friendliness. LET'n'C knows the required information of all partial and total lunar eclipses of the 21. century. The eclipse of interest, the time zone, and all camera settings can be selected or changed with the computer mouse or mouse pad. Once the Canon EOS camera is connected and powered, eclipse photography is ready after a few mouse clicks. Compared to solar eclipse photography, especially during the spectacular begin and end of totality, and the short duration of the totality, lunar eclipse photography is not really time critical. Basically, lunar eclipse photographers want to take pictures at a given time interval. LET'n'C users can chose from a set of time intervals (every 1, 2, 3, 4, 5, 6, 8, 9, or 10 minutes). For each time point, LET'n'C calculates the brightness value Q (see above) from the eclipse phase. LET'n'C proposes 'optimal' ISO and exposure time settings, and creates a line in the exposure table. The exposure table can then be fine tuned by the user. LET'n'C has three program forms. If the program is started, many settings from the last session are loaded, and the main form is shown. It looks like the following picture. File and Exit terminates the application. This is the same as closing the application by pressing Alt-F4. Camera opens the camera control and eclipse photography form. Exposure Tables opens the form for creating and fine tuning exposure tables. In Options , users can modify some preferences. About shows some program version information. 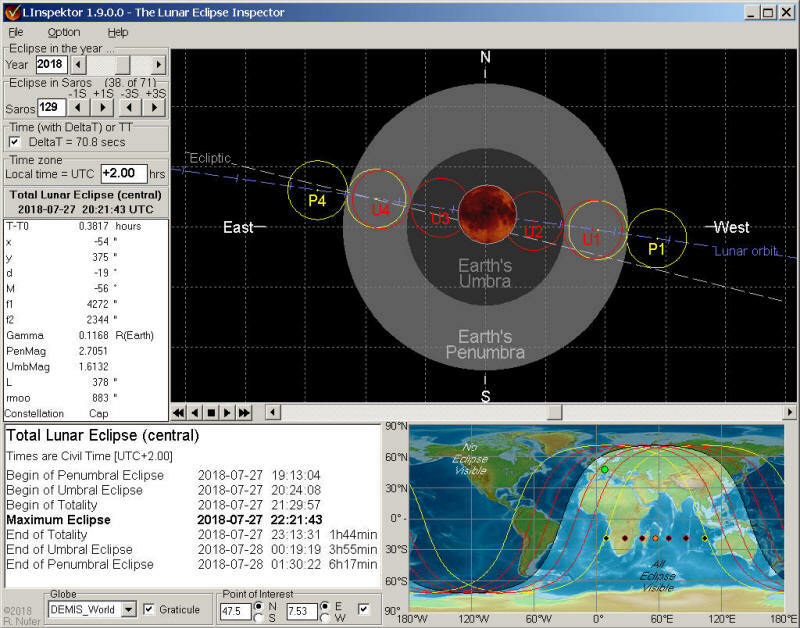 The right part of the main form shows the system time of the user's PC, and the time points of the different eclipse phases. In addition, the remaining time (countdown) from the actual PC time to the respective eclipse phase is shown. U2: Begin of totality. This field is empty for partial lunar eclipses. U3: End of totality. This field is empty for partial lunar eclipses. Users can change two Options . If option Eclipse times rounded to minutes is ticked, all eclipse times are rounded to full minutes. IMHO, this precision is enough for lunar eclipse photography. Select the lunar eclipse you want to photograph. The date and time of greatest eclipse (always in UTC) and the eclipse type is shown. In LET'n'C, the possible types are "partial", "total" and "total (central)". 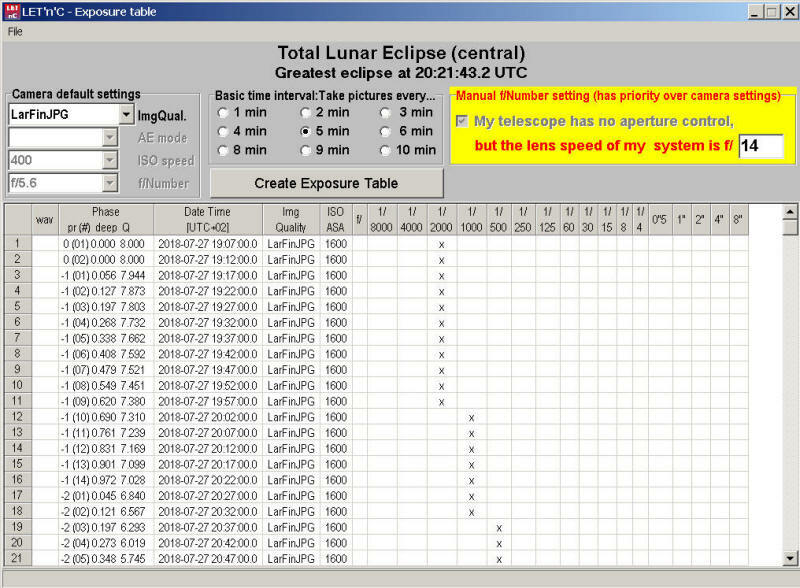 Select the time zone of your computer at the location, where you want to photograph the lunar eclipse. By default, the Interactive Camera Control page is shown. Note: The Camera must be and REMAIN in AE mode M ! The grayed and inactive AE mode field should remind you NOT to change the AE mode. You can now take your first "remote" picture by pressing the release button. Changing any settings on the form are reflected on the camera screen. Changing any settings on the camera are reflected on the camera form. Note: The pictures are saved in the memory card of the camera. LET'n'C does not transfer any pictures to the computer. The next page on the Camera Form is called Advanced Camera Tests . This page is not for you. I use this page for test purposes. The third (and most important) page on the Camera Form is called Eclipse Photography . Before you press the Test Eclipse Photography button or the Start Eclipse Photography button, an Exposure Table must be created. If you have not already done, go to the Main Form, select Exposure Tables and press the Create Exposure Table button. Keep the Exposure Table open somewhere on the desktop. When this button is pressed, the pictures are taken according to the Exposure Table, but the date and time are ignored. With this test you can quickly check, weather your memory card has enough storage capacity. If you didn't already create an exposure table, a message is shown in the right text box.. When this button is pressed, the eclipse photography starts. You can press this button at any time. In the middle text box the description of the next action will be written, the time difference to the action (yellow) and the date and time of the action (gray). The following picture shows this Real Time behavior. The button Start Eclipse Photography was pressed on June 17, 20,8, about 40 days and 7 hours before the beginning of the total lunar eclipse on July 27, 2018. During the real lunar eclipse you leave the computer untouched !!! But for test purposes, a "Rehearsal Time" can be advanced to the next Line in the Exposure Table. If the button Advance Time is pressed exactly once, you can test the complete eclipse sequence of actions without waiting for the real eclipse to begin. If all lines in the Exposure Table are processed (and all pictures are taken), the system resets automatically to Real Time mode. Date and time are advanced to 5 seconds before the next event, and counting. The "System Time" indicator in the middle column on the main form changes to "Rehearsal Time" and the background changes to red color. This is a warning indicator that the program LET'n'C is NOT in real time mode. You can press the Back to Real Time button at any time of the tests. 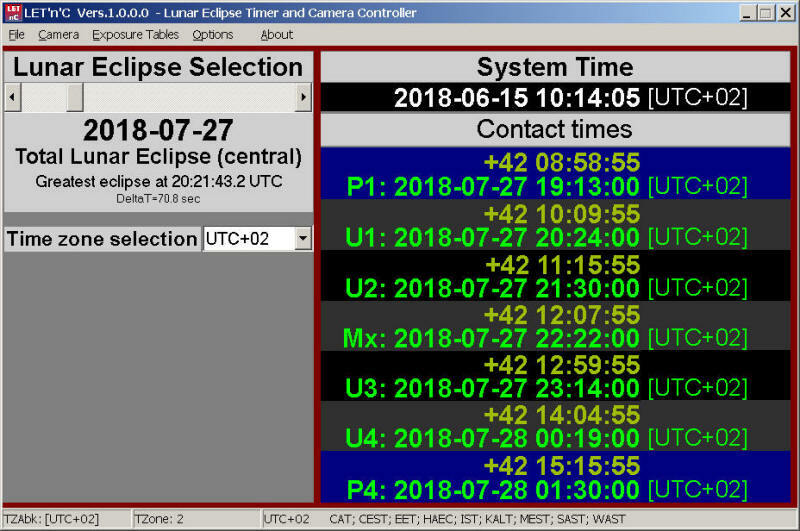 Verify, that the desired lunar eclipse is shown, and that the correct time zone is shown in the third header line (Date Time [UTC+02] in the above example). Enter the lens speed of your camera system. Important: Principally, the f/Number settings of Canon EOS cameras with standard optics could be changed programmatically. But for astrophotography with telescopes this is often not possible. Therefore, you have to tell LET'n'C the lens speed of your system, even if you plan to use a standard objective! In this program version, LET'n'C will not make any f/Number changes. If you use a Canon standard objective, you have to verify, that the aperture value is set to the same value! Select the desired time interval. Click Create Exposure Table . the user defined basic time interval (5 minutes in this example). To find the time point of the first image, LET'n'C starts at the time of maximum eclipse. From there, the time is decremented in regular steps defined by the basic time interval, until one or two steps before P1 (begin of penumbral phase). The time point of the last image is computed accordingly until one or two steps after P4 (end of penumbral phase). For each step in between, the phase of the eclipse and the brightness value Q are computed. Based on Q and the user defined aperture value f/Number (14 in this example), a combination of ISO and exposure time is computed. This is done in a grid search with 70 meshes, assuming ISO values of 100, 200, 400, 800, 1600, and exposure times of 1/2000, 1/1000, 1/500, 1/250, 1/125, 1/60, 1/30, 1/15, 1/8, 1/4, 0"5, 1", 2", and 4" are available. The combination of ISO and exposure time that comes nearest to the computed exposure time according to Espenak's formula is then chosen. The reciprocal difference of the combination ISO=1600 and exposure time=1/2000 is the smallest one (0.011). Therefore this combination is chosen for the first line in the above exposure table. Of course, the other combinations are roughly equivalent, and users may prefer other combinations. In this version of LET'n'C higher ISO values and shorter exposure times are preferred over lower ISO values and longer exposure times! This "side effect" is an advantage for users without special lunar guiding equipment. Even with a motorized equatorial mount that follows the stars, the Moon will appear blurry with longer exposure times due its relative movement over the sky. Moreover, IMHO "It is better to have a grainy image than a blurry image." Now we can have a look at the entries in the exposure table. Column wav shall be ignored and must remain empty. Column Phase describes the situation with four numbers: Pr , (#) , deep , and Q . 0 = no eclipse. Full Moon. The eclipse has not yet begun or is already over. of the current eclipse phase to the begin of the next eclipse phase. Before and after the lunar eclipse, where Pr is 0, deep is zero, too. Q is the brightness value. Column Date Time lists date and time for shooting the image. Verify, that the correct time zone is shown. If more than one exposure time is checked, this is the time point of the shortest exposure time. Further images will be shot "as soon as possible". Column Img Quality shows the image quality to be chosen. By default, this is the best JPG mode LarFinJPG, which is available for all Canon EOS cameras. If a Canon EOS camera is connected, users can change to another image quality from within the exposure table form. Column ISO shows the chosen ISO value. Column f/ is empty by default. Columns 1/8000 to 8" contain the letter 'x' for the chosen exposure time. By default, only one of the columns contains an 'x'. Exposure tables can be saved and loaded back using the File menu option. At each time point, more than one image can be shot. All exposure times with an 'x' are shot (as fast as possible) beginning at the time point in the column Date Time . If you want to have an an additional image with identical settings as the first row, set the 'x' accordingly. In this example, the exposure table will look like the following picture. Note the shorter exposure time during totality, because we have not changed the ISO sensitivity during totality phase. If you prefer to shoot RAW images for every second time point, you have to find out the exact ImgQual. description. For this, you have to enable connection to the Canon EOS camera. For my Canon EOS 400D the code is RAW+LarFinJPG. Because the Moon's brightness during totality is not known in advance, you may want to 'x' a shorter and a longer exposure time. Manipulating cells in the exposure table is similar to editing cells in Windows Excel. You can even delete and insert lines. To do so, you have to right-click on the line number at the left edge of the exposure table. A small buttons field will appear. Date and time are copied to the inserted line. The time point is identical to the previous line. This means, that the commands are executed "as fast as possible", but not before the time point. Date and time can be modified by the user, but the format must be exactly the same (seconds with one decimal digit). The remaining cells are empty for the moment. As an example we want to shoot two additional images with ISO 3200 sensitivity and exposure times of 4" and 8" . Enter 3200 in the ISO cell and put an 'x' into the 4" and 8" columns. We have not made an entry in the Img Quality cell, therefore no command is sent to the camera, which remains in the Img Quality mode RAW+LarFinJPG from the above line. Close the small buttons field by clicking Done . 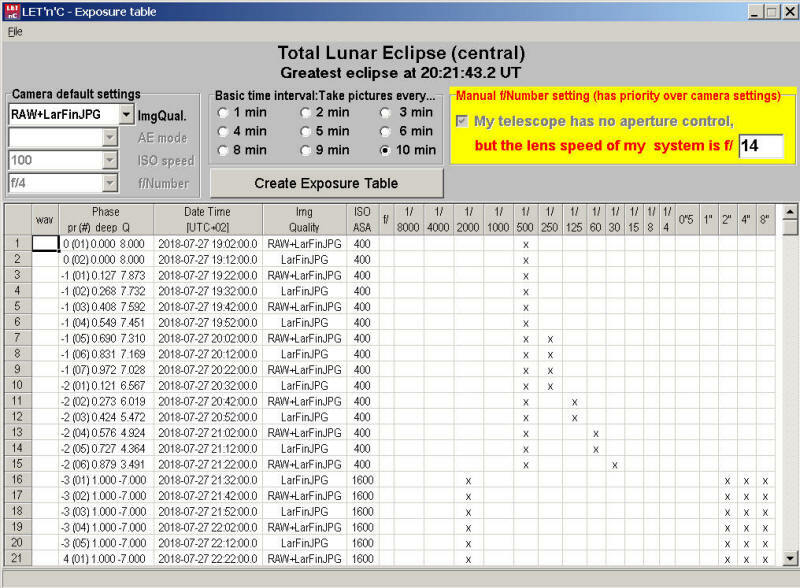 During eclipse photography, the exposure table must be opened and visible somewhere on the screen. Power connection (AC adapter) for the computer. Note: Eclipse duration is often more than 6 hours. Power connection (AC adapter) for the Canon EOS camera. Tripod and camera are set-up at a location, where the Moon is visible for the next 6-7 hours. Memory card is inserted and formatted. Canon EOS camera mode is set to manual M.
Canon EOS date and time are set to the same time zone as chosen in the LET'n'C main form. Computer date and time are set to the same time zone as chosen in the LET'n'C main form. Autofocus is disabled after focusing (suggested). If available, aperture value f/Number is set to the same value as entered in the Exposure Tables form. 20181229 1.1.1.0 EDSDK.dll 3.9 installed. Bug corrected (ISO 32'000 and 40'000 for Canon EOS 5D Mark IV support). 20181228 1.1.0.0 EDSDK.dll 3.9 installed. 20180614 1.0.0.0 Initial version. EDSDK.dll 3.4 installed. For Windows XP / 7 / 8 / 10.